Ordinarily, if I want to produce wonderful effects with color, 99% of the time, I prefer stranded knitting over other methods. It’s a very rare day that I’m working on a monochrome project, such as you’d often find in lace knitting. Yawn! For color interest in lace knitting, I know you can use variegated yarns, but while many of the variegated yarns do provide plenty of color interest, they often do so while diminishing the impact of the lace’s texture. 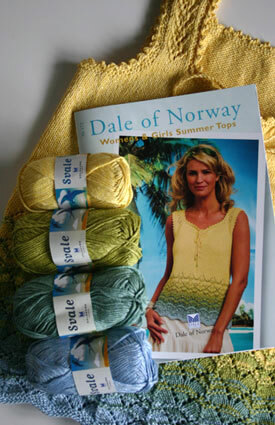 The Svale tank top on the cover of the new Dale of Norway Book 172 shows magnificent blending of colors and the color gradient produced actually highlights the lace’s texture. 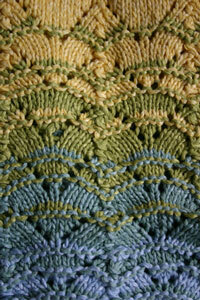 It’s all done in pretty common lace stitches using only 1 color per row/round – it’s not stranded at all. I was lucky enough to snare a model of that Svale tank, so I thought I’d share the wealth, above and below. FYI, the tank instructions are in ladies’ XS – XL. A large size takes 6 balls of the main color (buttercup 2005) and 2 balls of each of the following: powder blue 5812, jade 7432 and lime 9425. BTW, Book 172 also has instructions for several other summer tops for all girls from 2 to 102! As always, feel free to write or call with any questions. Happy knitting! 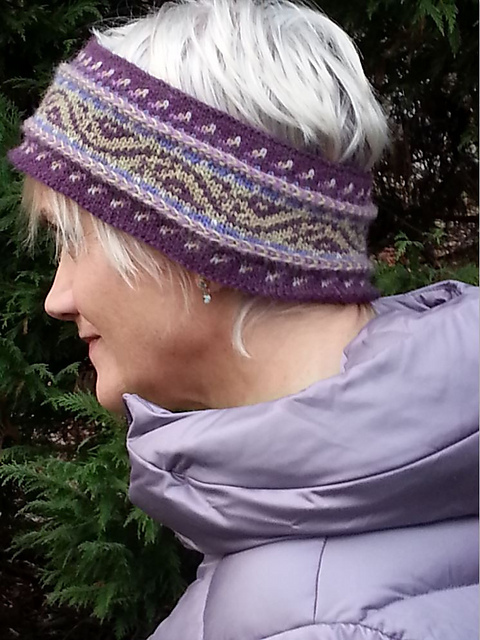 This entry was posted in New From Dale of Norway and tagged Dale of Norway, Knitting, svale yarn. Bookmark the permalink. I love the colores and the shading into the next color into the pattern. I realy was happy with the buttercup and greens; but than the blues came out as I scrolled down and I had an OH Wow when my heart went pity-pat. This is beautiful and I want to add this to my to do list. Can you send money? I am broke right at the moment. I am joking about the send money, but not about the broke part! Sure, you could either add fitted sleeves to the body (without doing the armhole trim, of course), you could omit the armhole shaping and add dropped sleeves (a bit easier) or, easiest of all, you could take the technique and stitch pattern for the lace on the bottom part of the tank and use it on any one of several of the Dale Svale patterns (or any of the many patterns in the same gauge) that already have the type of sleeves you’d like. And another thought: If you’re not into winging your own sleeves, the new Dale Book 187 has this same lace design in it, albeit in a different colorway; plus, it has a new fitted, short sleeve tunic version. I have it on my site here: http://www.kidsknits.com/store/dale_of_norway_book187.html. If you’re trying to decide between the two, Book 172 has a mix of tops for babies, kids and adults; Book 187 is entirely for ladies.